Inga was deliciously, er, deliriously happy to begin seeing TV commercials for Nutella, a chocolate hazelnut heroin popular in Europe and even more popular with Inga. This stuff was a mainstay of her diet during the two years she and Olof lived in Sweden. Nutella has actually been available for quite a while in the U.S. in the peanut butter aisle. It’s most common application is as a spread on white bread, the breakfast of non-champions. Even the commercial doesn’t try to sell you on the health benefits of Nutella itself, but as a vehicle to get your kids to eat something that is. But here’s where Inga thinks you have to view nutrition creatively. So all those healthy hazelnuts floating in their cocoa-based fat suspension are a dietary slam dunk in comparison. Nutella makes a sinfully oozy filling for a crepe. (The crepe is also supposed to have fruit but Inga regards this as a distracting contaminant.) It’s equally great on ice cream. Or rubbed on Olof and… oops, getting carried away here. Sadly, someone of Inga’s age and avoirdupois does have to show some restraint. Inga long ago concluded that putting Nutella on bread only dilutes its rich chocolately gooeyness; it should ideally be mainlined, er, consumed in its purest right-out-of the-jar form. But she pledged to restrict herself to a tablespoon per day – 100 calories, 6 grams of fat, no worse than peanut butter. It turns out, however, that if you use a soup spoon (the equivalent of a tablespoon) and you buy the large economy size jar of Nutella, you can get the spoon buried into the Nutella jar about five inches up the handle. Then with dedicated practice (it’s all in the wrist), one twists the spoon until a giganto glob of Nutella at least three inches in diameter is wrapped around it. A power drill may be employed if necessary. Of course, to get full immersion of the spoon into the Nutella, one’s fingers often inadvertently end up in the contents of the jar, sometimes one’s entire thumb! And if one is not careful, the index and middle fingers as well! Which must be licked! And which is the only explanation as to why a large economy size jar of Nutella has at best three tablespoons. 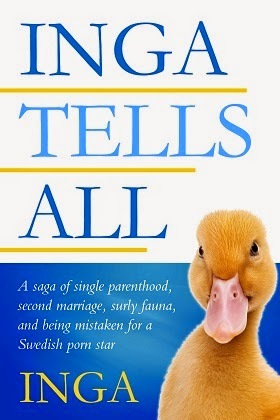 And is also how Inga lived in Stockholm for two years with no car, walked five miles a day, and gained twelve pounds. No, despite the new TV ads and those wonderful Swedish memories, she’s going to have to give the Nutella aisle a wide berth. At least that’s what her Nutella Anonymous group has advised.